For a class field trip we visited McConnells Mill in Portersville, PA. I visited McConnells Mill once before in the winter, so when I saw it then it was completely different. I could actually see where I was stepping and what was actually around me. I think it’s very beautiful and definitely a site to see for those who don’t live too far. When we arrived, the mill and red covered bridge were the first two sites to see. It was really early in the morning so the fog was heavy in the sky, but not much on the water. Some of my group members went ahead, while I stood back and took a photograph of them. After I let them venture a little we went around the mill to the observation deck. From there I photographed the red covered bridge. It was really beautiful since the red stood out from the greens and the light fog. Once we had taken enough pictures there we decided to take a small trail that led upstream, away from the mill. As we walked along that trail we found some flat rocks that jutted out into the water. We all climbed out onto them and took in the two very different views. When we faced upstream there was a beautiful site of the stream, calm, with fog in the horizon. 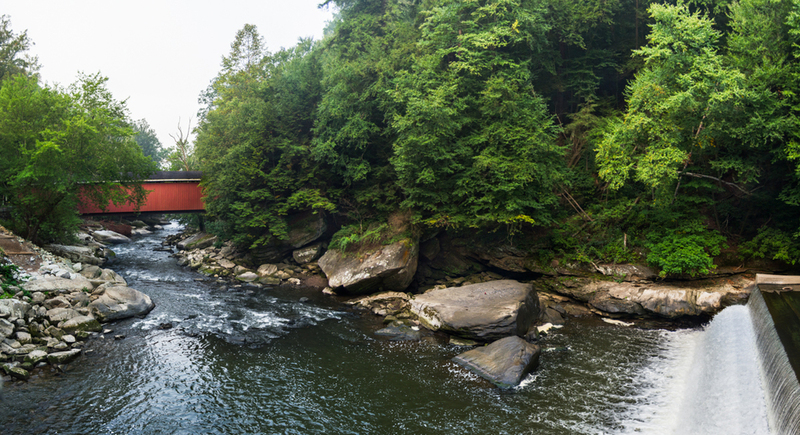 But when we turned around we had a view of the mill and the red covered bridge with the green foliage around it. It was interesting to turn around and see a completely different view of nature, but it was calming. We stood there for a while just taking in the scene. The crisp air felt nice and the water was calm. We continued along the trail, watching our step since there were rocks and roots sticking out from the ground. We walked along the bank for the stream, as we progressed the water was getting rougher and the rocks became bigger in quantity. We reached another flat landing rock, which we took a seat to relax. It was getting warmer out so we took a break to cool off. As we sat on the rock, I took a photograph facing upstream once again. There was a fallen branch that was half in the water. 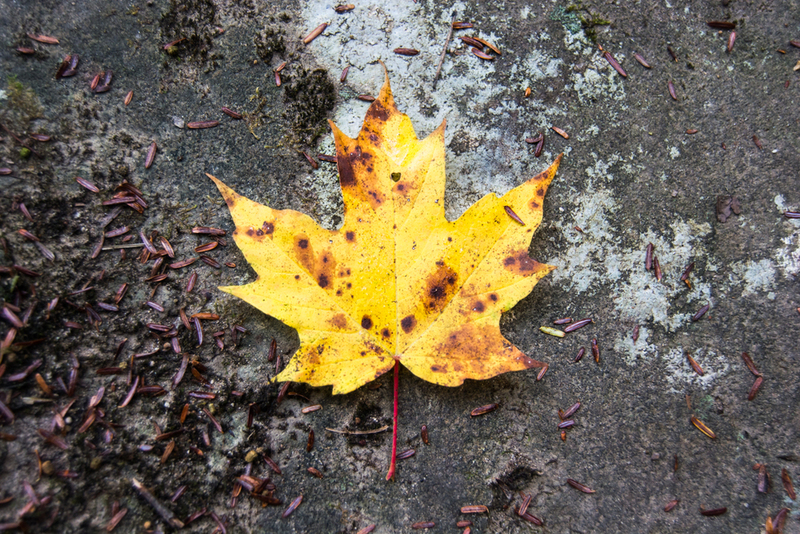 What made this scenery interesting to me was that to my right there were orange and red leaves laying on the rock. It had not turned autumn yet so none of the leaves on the trees were completely changed yet, except for some yellow leaves. It was a beautiful site to photograph though. After a little while I had turned around to start heading back, but I stopped short when I saw something that I love photographing. There was a huge hornets nest hidden within the trees. I could only see it from the exact spot I was standing. Thankfully I had my zoom lens and was able to capture it. Looking through my lens I could see that it was in fact active. There were hornets flying in and out of it, so I made sure not to get too close. Once my group let me finish photographing the nest, we headed back to the car. We stopped at the mill and covered bridge one last time to make sure we all got the photographs we wanted. I snapped one more shot of the covered bridge since it was brighter and warmer out and then we headed off back to our school. I’ve always liked McConnells Mill. It was more dangerous in the winter, but it was still beautiful in the summer. I can’t wait to see what it will look like in autumn! 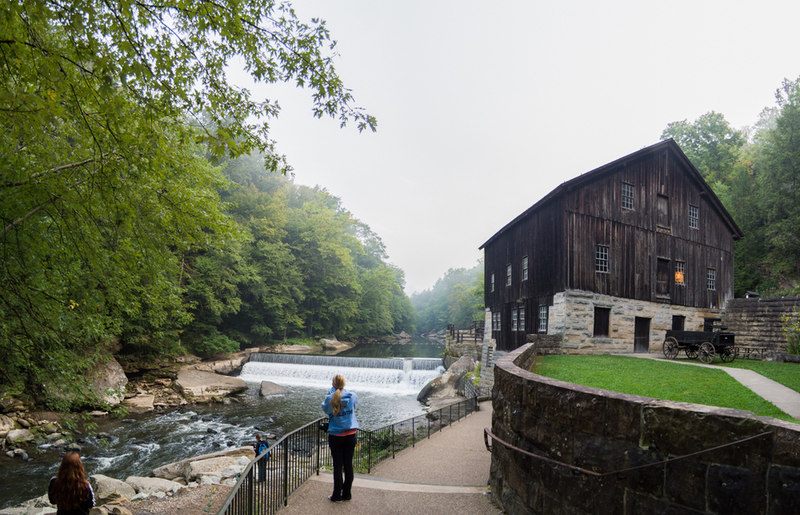 I hope you enjoyed my photographs and if you would like to check out my trip to McConnells Mill from the winter you can see it here!